January 2015 is here and we hope your new year has been great so far. This time of year is when a lot of homes get taken off the market until the spring selling season rolls around. Right now, we are down about 22% in inventory from last month, and 10% down from this time last year. What is going to start to happen is while sellers are coming off the market, a lot of buyers will be coming onto it. If you or somebody you know has been looking to move, this is a great market to sell your home in. The lack of inventory will have serious buyers chomping at the bit for a good home. 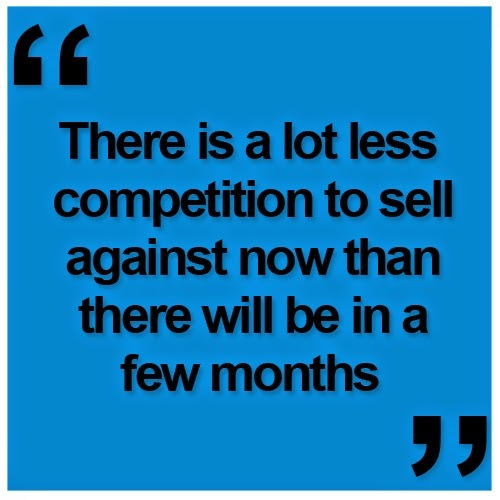 There is a lot less competition to sell against now than there will be in a few months. Think about it like this: 20 homes on the market for every one buyer is nowhere near as good as 5 homes on the market for every one buyer. Now you are beginning to see why it behooves you to sell your property when you have less competition. As always, if you have any questions for me, feel free to reach out to me by phone or email. We look forward to hearing from you soon!